Hope you all had a lovely weekend. I received my most recent order from Feelunique late last week – The main reasons for placing my order was to reorder one of my ‘hero’ products, the Antipodes Divine Face Oil – please see my earlier review on it here, and also to redeem my £3.95 gift voucher – I had paid £3.95 for shipping & handing for my Pick ‘N’ Mix order which I then received back in the form of a gift voucher – to see details on the service and what I received in my Pick ‘N’ Mix order, please see my previous post here. As I was placing an order anyway I decided to purchase some items from the Fleur de Force range (so glad I did) as I had never got round to trying any of her products (although had purchased a few of her sets as gifts last year) and also because I seen they were on sale with an additional 10% off sale items at the time I purchased. An absolutely beautiful quad and the eye shadows are so pigmented, high quality and very long lasting especially with eye primer- the palette I received contains a beautiful light rose / taupe pink colour, matt base colour, cream / v light pink pearl colour and a dark mauve almost brown colour with shimmer – definitely recommend purchasing this palette. Love the Fleur de Force signature on the front too – just adds that finishing touch. Definitely thinking of purchasing the 010 Cosmic Bronze palette as well even at the full price, as still very reasonable for the quality of the shadows. However as always I will search for the best offer available at the time as there are always regular discount codes available. £6.12 for 9.5 ml – all back to full price again too. Gorgeous wine / berry colour – also suitable to wear anytime but especially for the evening / night out. 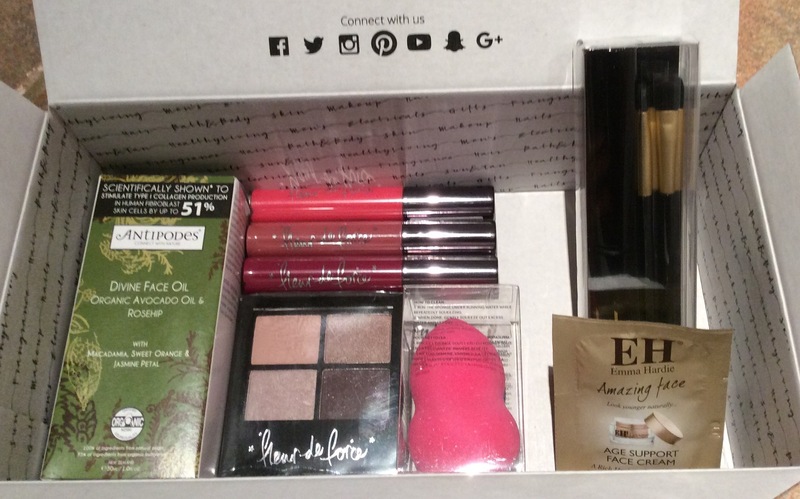 I also received cashback on my order – for details on how to receive cashback please see my previous post here, you can also use my link here to sign up if you want; and the following free samples as well, an Emma Hardie Amazing Face Age Support Face Cream 5 ml sample sachet and a Feelunique makeup set which contained a blending sponge and a brush set – so v happy. I hope you found this useful and remember to always check best offers available before purchasing and go through the topcashback site first to claim any cashback available when purchasing.